Problems happen. Does Problem Solving happen in your business? Learn to solve any problem. For good. Tom Adair, drawing on three decades of experience as an internationally known author, lecturer, coach, and Toyota-trained lean Sensei, has written a clear and accessible problem solving primer. In Solved! 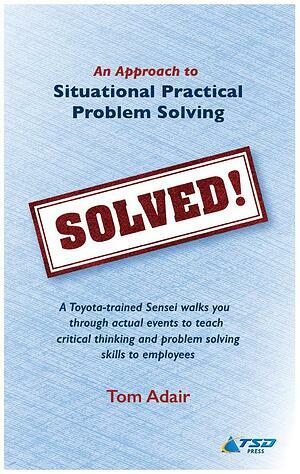 An Approach to Situational Practical Problem Solving, he carefully walks you through the Toyota-based method for getting to a problem’s root cause, provides step-by-step instructions with real-life examples, explains each principle along the way, and provides a strategy for implementing and sustaining your countermeasures so they become permanent fixes to your most challenging problems. Tom fills his book with real-life scenes and dialogue that bring you into the problem-solving experience. See how easy it is to jump to conclusions based on the wrong assumptions, and see how following the process and continuing to question the “facts” can bring you to the root cause and an eventual solution. Also, see how management and on-the-ground value adders can work together to solve problems quickly and effectively. Tom explains his five fundamental principles of SPPS, and then demonstrates the important roles they play throughout the problem solving process, as seen through a series of case studies. What can you take away from this ebook? Who needs problem solving help? Everyone encounters problems, and everyone needs to learn the skills to solve them. This makes “Solved!” an invaluable resource. Tom has taught SPPS to those in industry, government and the military and this ebook takes those lessons and distills them into the essentials of SPPS; the methodology works in any environment. As a leader or manager, when you see the same problems reoccur or find yourself drawn into the search for solutions that your people should be able to find themselves, then you appreciate the need to develop better problem solvers within your organization. As an on-the-ground value adder, when you see bureaucracy or inefficiency get in the way of a common sense resolution to a problem, then you wish for a better way. “Solved!” can be the first step in the answer to both situations. The method taught and real-life lessons demonstrated in this ebook can provide the knowledge base for an organization-wide effort to make everyone an active and empowered problem solver. TSD is proud to offer several resources for improving problem solving based on Tom Adair’s Situational Practical Problem Solving methodology and can accommodate the one that is right for you and your business. The most popular option is a targeted workshop by Tom, hosted at your facility. This workshop introduces participants to the lean “Situational Practical Problem Solving” (SPPS) method, as developed and refined by Tom, the Toyota-trained Lean Sensei responsible for developing the problem solving curriculum in Toyota’s first North American plant in Georgetown Kentucky. The method, tools, and techniques you’ll gain from this workshop are the same ones used extensively in the Toyota Production System, or TPS, across the US and Canada. If you are interested in hosting a workshop, or learning more about a workshop, click the button below, submit the form, and TSD will be in contact with you. Tom is a veteran of Toyota’s first North American plant in Georgetown Kentucky, retiring as their Quality Circle Administrator with nearly 20 years of service. He went on to design and implement lean-based improvements and systems around the world for the US military and companies like Woodbridge Foam Fabrication and Qualitest Pharmaceuticals. He has trained and coached everyone from corporation leaders to on-the-ground workforce in such subjects as culture change, problem solving and critical thinking, all essential in developing a learning organization. Are you interested in hosting a SPPS workshop led by Tom?